Visiting Japan for all the Black Butler merch or seeing a Black Butler stage play? Or perhaps as a fan, you’re interested to experience having a butler in a Butler Cafe? — Media or film-induced tourism in the Western world is known as Contents Tourism in Japan. And pop culture has been cited as one of the biggest contributors to Japanese tourism as a whole. Fans of Japanese pop culture would know. Japan is likened to a holy land for the “otaku” (and I’m using the term very loosely as international fans use it) and every year, they make up a large portion of tourists coming to Japan. It is without a doubt that manga, anime, novels—as a huge part of Japanese pop culture are well-recognized to have existing international fanbases. 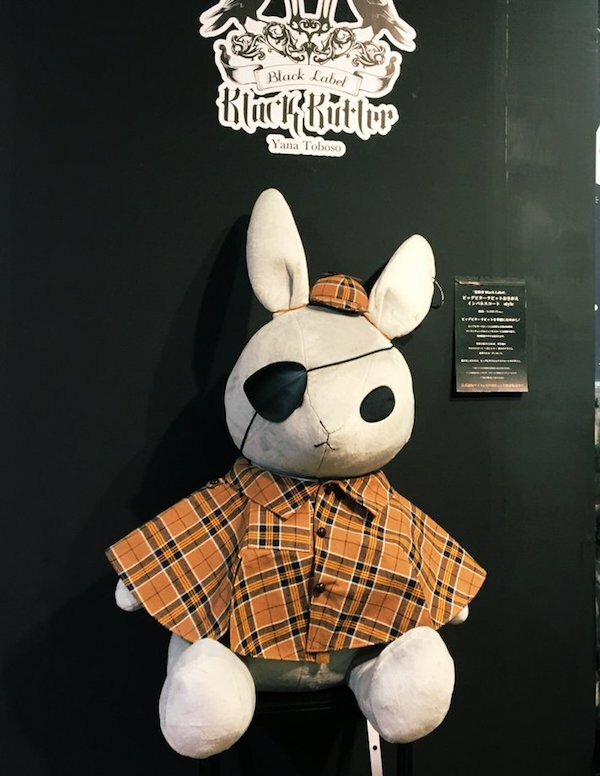 A huge Bitter Rabbit greeting the customers to the Black Label Pop-Up Store. While in Hollywood and in the English-speaking countries, in general, categorize the pop-culture-induced tourism according to the differences in medium (books, films, tv series, etc. ), it’s slightly different in Japan. The Japanese focused on the content, namely the characters, the narratives, and the locations. This is because Japan recognizes the influence of media mix, most notably, the same characters are used in a variety of media such as both anime and novels, while having a manga adaptation as well. Merchandise often reflect this, especially in terms of characters. Black Butler merch is merely one example among all. Black Butler, or more intimately known to fans as Kuroshitsuji, is a phenomenon in itself. The series is without a doubt, the most well-known in both Japan and globally when it comes popularizing the butler trope. 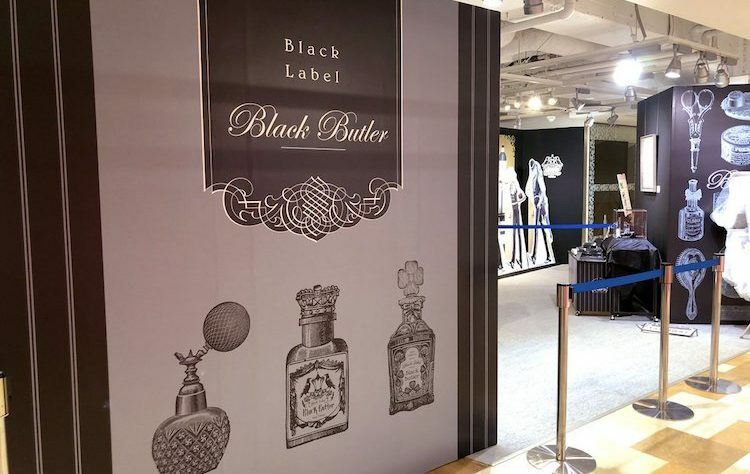 As a result of contents tourism, the Japanese creators of Black Butler has started to accommodate international fans as well. One of the most notable examples of this is the creation of the English-language website to purchase the Musical Kuroshitsuji tickets to see the stage play. The series is beloved by many. 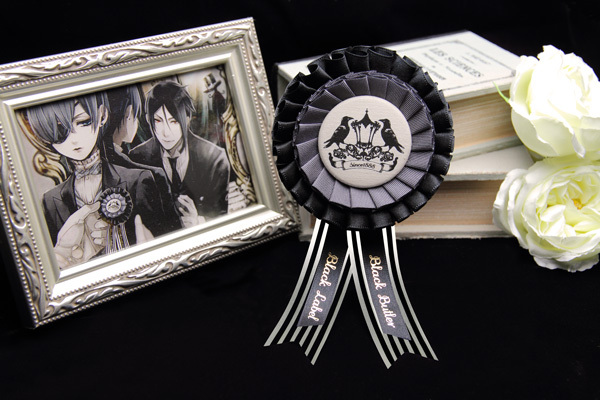 Black Butler merchandise is continuous, actively produced as the series continues. In 2016, the series creator, Toboso Yana, officially created “Black Label” under Square Enix, the publisher of manga magazine where Black Butler is serialized. 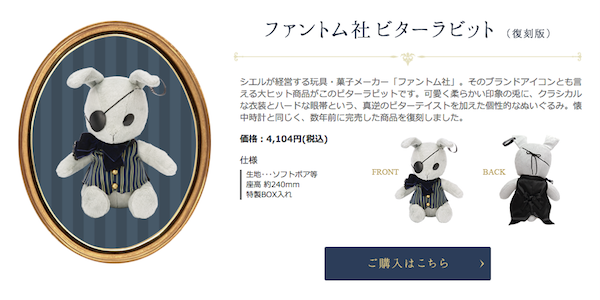 Faithful to the series’ serialization, most of the Black Butler merch can be categorized as “high-end”. The luxury theme pays homage to the aristocracy most of the series’ setting is based on. Let’s take a look at some of the most popular Kuroshitsuji merch. In the Kuroshitsuji manga, Ciel Phantomhive is the founder of a Victorian England’s most famed Toy Company, the Funtom’s Co. The Bitter Rabbit is one of their most popular products in the manga. 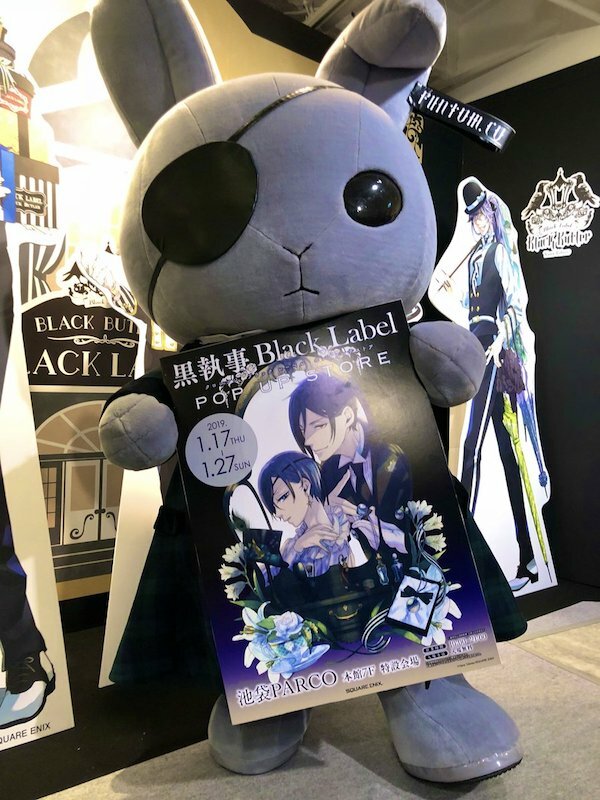 Similarly, in real life, Bitter Rabbit is also one of the most popular Black Butler merch among the many merchandises that have been released. There are several version of Bitter Rabbits that have been released to date. And it’s expected to continue to grow. 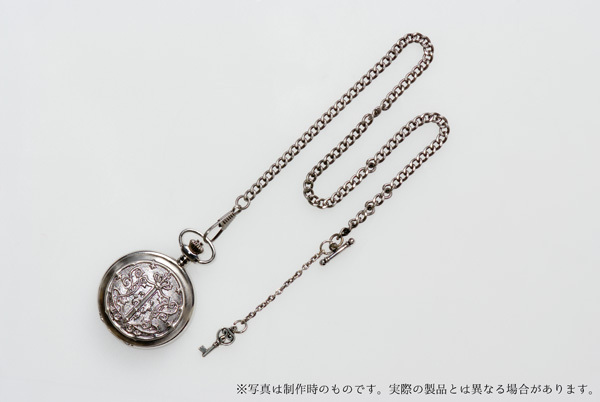 A device Sebastian uses every day, the pocket watch that contains the Phantomhive emblem is one of the most iconic items in the Black Butler universe. The creators of the series definitely did not waste the time to make the archaic time device as merchandise. One of the most in-demand luxury merchandise, the Black Label Rosette is handmade. The accessory is made of Satin. Japanese fans often put the rosette on their bags for the accessory. During an anime convention or a Kuroshitsuji event, you’ll see a lot of women wearing their Black Butler merchs proudly. It’s a subtle way of announcing to the world your love of the series. Kuroshitsuji is one of the first series that holds product collaborations with Super Groupies and the series that has the most collaborations since 2015. One of their most popular collaborations is their mangaka-designed shoes. The creation process of the goods is said to heavily involve the Black Butler creator herself. Black Butler x Supergroupies collaboration that mainly features stylish everyday items. The Animate Ikebukuro is the main Animate store with its very own building. It’s one of the most obvious places to go to if you’re an anime-manga fan. Head to the Toshima district. Animate is approximately 7 – 10 minutes walking distance from the Ikebukuro JR Station. The first floor of the Animate is commonly used to display the new releases. You’ll see the Black Butler manga greeting you as you enter the store. Kuroshitsuji is one the most frequent series that has a large display on Animate all-year long. Nakano Broadway is a shopping complex that comprises of many specialty stores that sell all kinds of anime and manga goods. 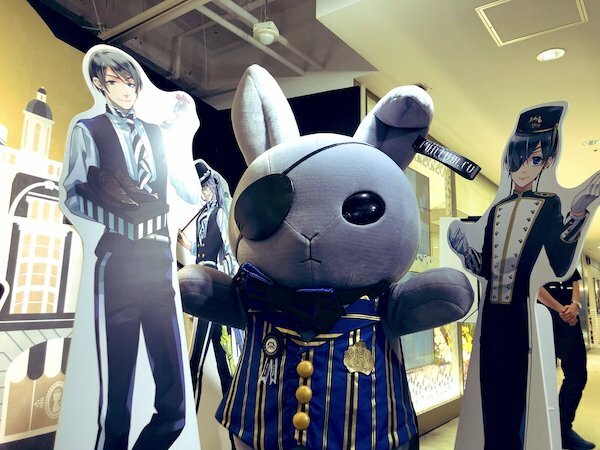 Being one of the most popular titles with the millennials, Black Butler merch can be found in abundance here, as long as you know where to look. There are several of the same-brand stores in this complex alone. The anime and manga goods can commonly be found at the second and the third floors of the shopping complex. 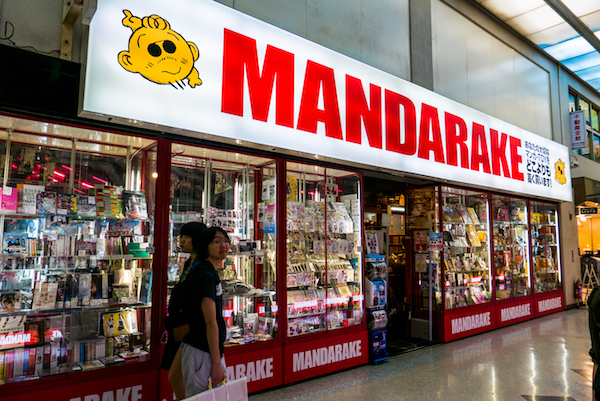 Mandarake is known for selling secondhand doujinshi or fan comics. Those who don’t read Japanese may not be interested in going to the Mandarake. But for those who know what a joy reading a doujinshi of your favorite ship, you’ll know that at least you’d want to get one of the doujin compilations of your favorite artist. 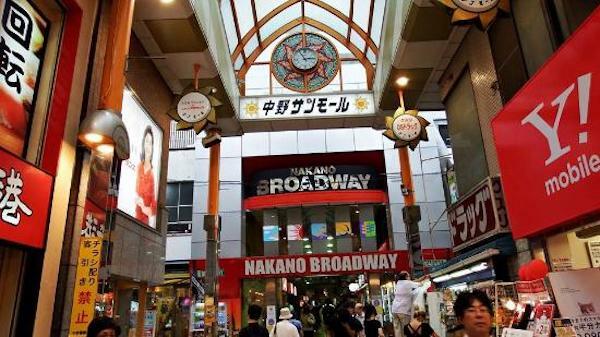 The headquarter of Mandarake is at none other than the Nakano Broadway. Aside from selling doujinshi, Mandarake also sells various figurines. From common to rare character figures and dolls, try to visit the place to look at the wealth of things they have. If your travel coincides with the dates of the Pop-Up Store, then you’re in luck. 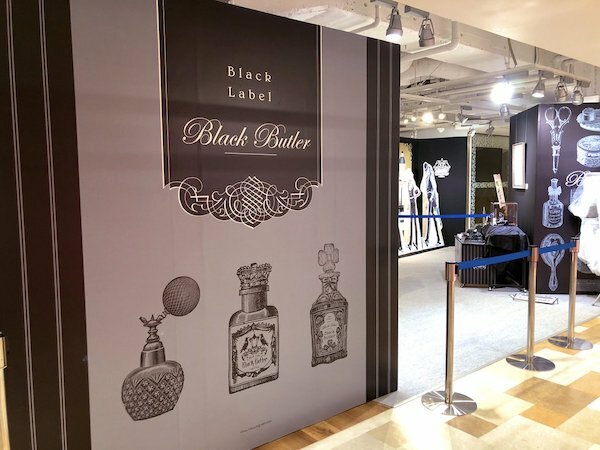 As of now the Black Label stores only opens as short-term stores that tour several regions in Japan. To date, the Black Label Pop-Up Store has opened in Tokyo, Kyoto, and Osaka. Black Label Bitter Rabbit Book of Murder version. The Funtom Cafe is also a temporary cafe that holds tour to many regions in Japan due to popular demands. As with any anime / manga-themed cafe, the menu items are all Kuroshitsuji character-inspired. The place is also where you can limited edition merchandise; the Funtom Cafe-limited Kuroshitsuji goods. Among the merchandise, there are Funtom Cafe original apron, Funtom Cafe original blanket, Funtom, Cafe tea, cookie, original tumbler, acrylic keychains, and others.